First of all, buying a crib mattress is an investment, not just a purchase. Your child deserves to have a good crib mattress that provides a pleasant sleeping environment—in every possible way! Some parents and guardians, however, make the mistake of settling for the cheapest product they can find or for a mattress with a generic brand/name. Well, thanks to the Kolcraft, you don’t have to pawn your wedding ring just so you can get your child a quality crib mattress. If, however, you are a choosy, particular and quality-minded parent/guardian, then why don’t you read on so you can see why this mattress is exactly what you and, possibly, your child were “dreaming” of. The company needs to put out more details about things like heat retention, fire retardancy, bounce, etc., in relation to this mattress. The truth is that light-weight foam mattresses are extremely popular for a number of good reasons. Besides being made of very light material (meaning that you can easily carry it, turn it over, etc. 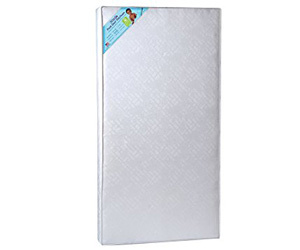 ), this mattress also comes with the right kinds of certifications and attributes. For instance, this mattress has Greenguard Gold Certification, which is assurance that this product doesn’t compromise the air inside your house like some toxic-smelling cheaper models can; quite simply, this mattress puts out very low chemical emissions. Also, it has an embossed hypoallergenic cover, bindings that are lock-stitched and waterproof, and a surface that can easily and quickly be cleaned off, thus obviating the possibility of dust and other allergens camping out on this mattress. Finally, this mattress’ square corners make for a nice, tight, no-moving-around fit inside the crib or toddler bed. In addition to meeting or exceeding flammability standards, this mattress doesn’t contain phthalates, lead, toxic fire retardants or CPSIA. The Kolcraft Fresh Start makes a great start at your door by arriving inside a strong-looking box—let’s just say it’s securely packaged. Actually, you will find two boxes inside. The bottom line is that the company strives to make sure that their products arrive in good condition and, while they can’t control the delivery company or person, they can make sure that poor packaging will never be the reason their mattresses will arrive anyone’s home damaged. Another thing that may surprise you is there not being any strong smells literally “dying” to come out to distress you. While no mattress is absolutely without any smells or scents, this mattress just doesn’t overwhelm anyone with such a problem. One of the most basic properties of a good mattress is being water-repellent or water-proof. This is important because it can prevent mold and bacterial growth, stains setting in and other problems. Another good attribute for this mattress is that it isn’t made from toxic materials. In fact, this mattress uses organic luxury cotton which is capable of making maintenance and cleaning rather easy and quick. The cover, furthermore, is capable of helping to keep dust mites and bugs away. There are basically 2 models to choose from, each with a natural finish—each of which is put through a rigorous quality assurance set of tests, including checking for safety issues, like potential unhealthy gas emissions. This mattress is a delight when it comes to moving it around or taking it out of the crib, which makes changing sheets a pleasure—and how often do you hear anyone say that about sheet changing? The fact that the mattress handles so well without making unseemly noises (as some cheaper plastic models are wont to do) is something that should also help in putting your infant to sleep without any significant problems. The Kolcraft Fresh Start being so lightweight also comes in handy when it comes time to clean the mattress, especially after an “accident” or a spill. Being able to remove or turn the mattress over is a breeze, as is wiping down with a damp cloth and a mild soap. This mattress’s waterproof capacity is due to or provided by the unique embossed cover that comes with this good-buy mattress. What’s-more, its unique lock stitching helps to prevent spills from seeping through into the mattress, ostensibly if a spill or mess is allowed to stick around too long or if the amount of spilled/exuded liquid is substantial. The dimensions on this mattress are 27.88 by 52 by 5.13 inches. It is made in the US. A foam mattress has a lot of advantages over one with springs. For one thing, it’s easier to change sheets on a foam mattress that is, in general, much less heavy than one made with springs. A foam mattress will easily cost less than its competitor and, when you bring the organic mattresses into the picture, foam mattresses are friendlier to the environment, tend to last a long time (when not abused), don’t tend to sag as readily and consistently as spring mattresses. Foam mattresses can also, on a number of levels, be safer—for example, a foam mattress would never injure a child because one of its coil springs broke through unexpectedly. Kolcraft Fresh Start may be ideally suited for you if you don’t want to spend the rest of your life looking at and comparing foam mattresses; unless you love to shop around and don’t really need to find a mattress right away, then stop looking—you’ve found what you needed in this mattress. Interestingly, the polyester core of this mattress is made with the use of recycled bottles, which sort of explains why this mattress has won awards for its eco-friendly design and construction. Some of the wonderful features that set this mattress apart include having a soft and firm foam cover, meeting or exceeding standards on air quality and toxic gas emissions, having a waterproof and hypoallergenic cover, having a surface that isn’t hospitable to either stains or allergens, and having square corners that make for a snug fit inside the crib. This mattress comes with a five year limited warranty which includes both materials and labor, should you ever find a functional or manufacturing defect or imperfection. This mattress provides very good firmness in spite of being made from foam. 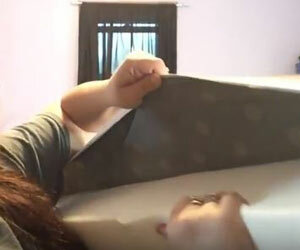 The Kolcraft Fresh Start may be sold primarily as a crib mattress but, based on its reported comfortableness and cushioned support, it can also be used on a toddler bed, as many parents testify to in online product discussion boards. As is often the case with mattresses that have square corners, this mattress fits snugly inside a US standard-sized crib or toddler bed. A snug fit is important because it will prevent children from being jostled around by a loose mattress. Also, a snug fit can prevent children from getting a limb (or, worse yet, their heads) caught in a gap left between a loose mattress and the rails or a wall (in the case of a toddler bed), which can lead to an injury. This mattress is rather affordable for the average household. It may not be the cheapest but, for the price, it’s certainly a good value, considering all that you get and how long you can expect to enjoy this product, provided that it is properly taken care of and not abused. Many parents report that this mattress is more than suitable for their toddlers, in spite of being ideally suited for infants—actually, it has features that can suit either age group. Foam generally gets good grades on “support,” and this mattress is no exception. Many parents/guardians report that their kids are loving sleeping on this mattress—what better testimony can you rely on than this? This mattress seems to offer all the comfortableness your children is likely to want or need. Unfortunately, some cheaper foam mattresses (as well as some spring coils ones) won’t pass the test on this measure of a mattress’ worthiness to be purchased and used by your precious ones. The Kolcraft Fresh Start, though, may be different in this department. Basically, you want a mattress that won’t sag over time (or if too much weight is put on it) on the edges. This can be a magnet for trouble if infants get to roll down into a ditch created between a sagging edge and a rail or if a toddler rolls off his/her bed during the night while tossing and turning. Actually, falling off a toddler bed can happen even if there is no weak edge support but having a weak edge support simply increases the chances for trouble. This mattress shouldn’t be any trouble for children with special allergies or sensitivities to certain chemicals. This mattress’ GREENGUARD Gold Certification signifies that it’s safe for indoor air in most homes since it’s been found to have low chemical emissions. Incredibly, Kolcraft has been in the mattress making business since 1946. In that time, the company has had plenty of time to try different things to do extensive research and development (R & D) and to gauge what their customers have wanted and needed most—as well, of course, what their children needed and wanted most. The crib and toddler bed industry has come a long way and this mattress is solid proof that things have improved for the better, as you will note after buying and trying out this mattress. As many people are willing to testify to online (and elsewhere), this mattress is a good buy for the average price being asked by online merchants. To make a long story short, this mattress passes all the basic tests on safety, comfort, support, firmness, durability, affordability, etc. It’s primarily made to be used on cribs but, thankfully and incredibly, it can also be used on toddler beds. What more can we say?